Now as a follow-on from that interview, conducted on July 23rd, Jim Cramer caught up Goldner to assess the progress Hasbro was making towards circumventing the Toys "R" Us liquidation and its other growth initiatives within the company. Goldner spoke to the Toy "R" Us bankruptcy and stated: "Modernizing our organization all around the world, our U.S. team did a fantastic job of continuing to manage the liquidation of Toy "R" Us, which is now complete." He continued on, "We're lining-up share recapture plans with our remaining retailers, building bigger programs for the holidays" while "working through the European situation, there's be disintermediation between online retail and the brick and mortar retailers, we'll work through all that as well and believe that all these issues will disappear by the end of 2018 and we move on to grow in 2019". Other noteworthy comments pertained to "Dungeons & Dragons" as it sees its best year ever. "People are more into 'Dungeons & Dragons' today than ever before," "People are re-engaged with that brand because it's a face-to-face game, it's immersive, and it's a game that people really enjoy playing with one another." "We just announced this afternoon that there'll be a crossover between 'Dungeons & Dragons' and 'Magic: The Gathering' in the fall, and I think our fans and gamers are going to be very excited about what's coming," the CEO said. Hasbro is creating a "suite of digital games" around both games to address the online e-sports trends. More than a million people signed up to test the beta version of the online spin-off of "Magic," titled "Arena," the CEO said. Millions of users watch others play the two games live on streaming platforms. He added that Hasbro's goal over time would be to build fantasy games like "Magic" into e-sports properties "ripe for global e-sports competition" as consumers increasingly choose digital gaming over standard tabletop games. Toys "R" Us filed for chapter 11 bankruptcy in September of 2017, and since then Hasbro has had challenges meeting its revenue and EPS targets. Post the Toys "R" Us disruption, Q4 2017 revenue numbers came in flat while Q1 2018 and Q2 2018 revenue numbers fell by 15.7% and 7%, respectively. 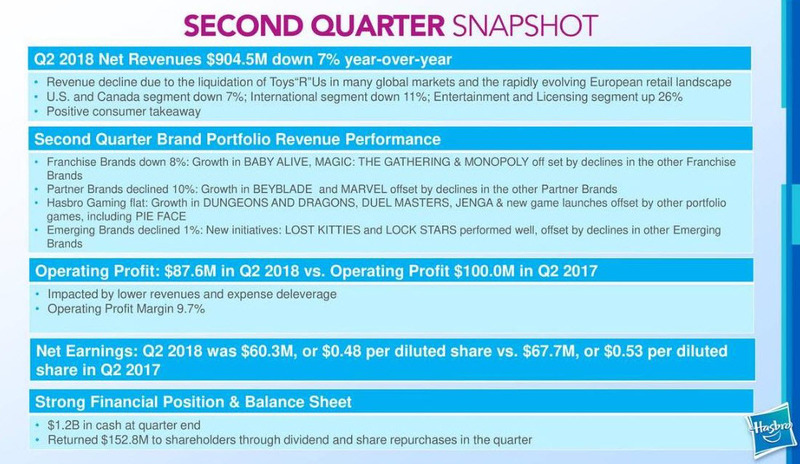 Hasbro is already trending back towards growth and looking forward, Q3 and Q4 2018 quarters will be compared to weakened numbers due to the fall out of the bankruptcy of one of its major retail channels. Moving further into the first half of 2019, this comparison will be even more pronounced and put Hasbro back on a growth path. Q2 2018 revenues came in at $904.5 million while U.S. and Canada segment revenues down 7%. Hasbro ended the quarter with $1.2 billion in cash and returned $152.8 million to shareholders; $78.7 million in dividends and $74.1 million in share repurchases. The lower revenues reflect the liquidation of Toys "R" Us in the U.S. and many other global markets. Also, revenues declined internationally, most notably in Europe, as a result of managing retail inventory amid a rapidly evolving retail landscape (Figures 1 and 2). "2018 is unfolding as expected as our teams manage the liquidation of Toys "R" Us in many markets and address the rapidly evolving European retail landscape," said Brian Goldner. "We are investing in our business - in innovation, entertainment, and a modern global commercial organization, to drive profitable growth in 2019 and beyond. Consumer takeaway is up for our brands, and we further strengthened our brand portfolio through the acquisition of POWER RANGERS. We are focused on moving beyond the near-term disruption of losing a major customer, with a clear path forward including new retailer activations to meet the consumer demand made available by the Toys "R" Us departure." "Our global teams executed well despite the disruption in the market," said Deborah Thomas, Hasbro's chief financial officer. "With $1.2 billion in cash and a healthy balance sheet, our financial position is strong. Our diverse portfolio enabled us to partially offset the negative margin impact from lower revenues, but not entirely. We are working with our retailers to successfully execute their plans for Hasbro's innovative portfolio this holiday season." Outside of its legacy games, e-sports initiatives and Hasbro Studios (My Little Pony, Power Rangers and Transformers' Bumblebee movie), Hasbro is the exclusive toy developer for many of the multi-billion dollar movie franchises such as Marvel Universe, Star Wars, Disney Princesses, Frozen, Transformers, Jurassic World and recently added Power Rangers to the mix. The Hasbro-Disney exclusivity rights span Marvel Comics and Star Wars toys which last through 2020 and Hasbro is also the licensed doll maker for the Disney Princess line (Moana and Frozen are included). Hasbro is capitalizing on the Blank Panther and Avengers: Infinity War home entertainment windows. Toys, collectibles, books, apparel and more will help drive Hasbro's results via digital and physical footprint channels. Hasbro Inc. (NASDAQ:HAS) is turning the corner with regard to the Toy "R" Us liquidation and "believe that all these issues will disappear by the end of 2018 and we move on to grow in 2019". To this end, Hasbro has exclusives with Wal-Mart (WMT), Target (TGT) and Amazon (AMZN) while building out it direct to consumer channel. Hasbro has many growth catalysts on the horizon via the diversity of its portfolio. Hasbro presents a compelling long-term opportunity with a great shareholder return policy via dividends and share buybacks. Despite the Toy "R" Us bankruptcy filing, Hasbro looks to be managing this liquidation and further penetrating into digital and footprint channels of distribution to mitigate this liquidation. 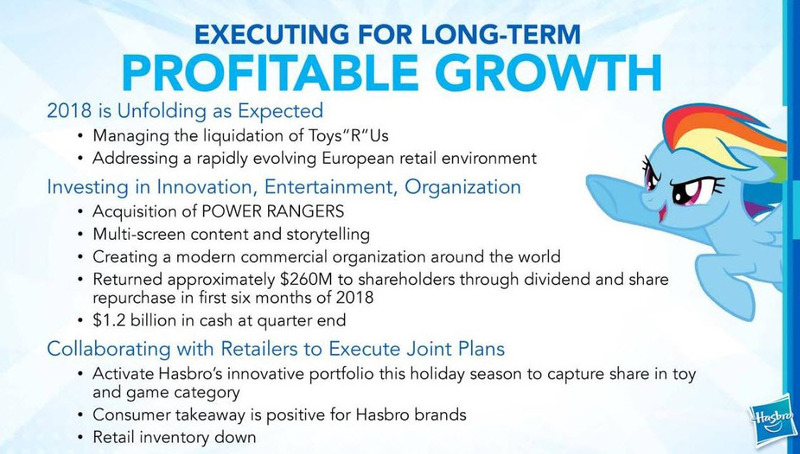 Analysts are coming in with positive commentary regarding the long-term outlook on Hasbro as the turn away from the retail overhang gains more traction into future quarters. Disclosure: The author holds shares of Hasbro and is long Hasbro. The author has no business relationship with any companies mentioned in this article. He is not a professional financial advisor or tax professional. This article reflects his own opinions. This article is not intended to be a recommendation to buy or sell any stock or ETF mentioned. Kiedrowski is an individual investor who analyzes investment strategies and disseminates analyses. Kiedrowski encourages all investors to conduct their own research and due diligence prior to investing. Please feel free to comment and provide feedback, the author values all responses. The author is the founder of stockoptionsdad.com a venue created to share investing ideas and strategies with an emphasis on options trading.